1.1 Standard penetration tests (SPT). 1.4 Stiffness and strength of rock. 2.2 Capacity of single piles. 2.3 Capacity of single piles in rock. 2.5 Capacity of pile groups. 3.1 Concentric cylinder model (CCM). 3.2 Nonlinear concentric cylinder model. 3.5 Coupled elastic model for lateral piles. 3.6 Elastic-plastic model for lateral piles. 4.8 Capacity for strain-softening soil. 4.9 Capacity and cyclic amplitude. 5.1 Visco-elastic load transfer behavior. 6.5 Boundary element approach: GASGROUP. 8.3 Capacity and lateral-moment loading loci. 8.4 Comparison with existing solutions. 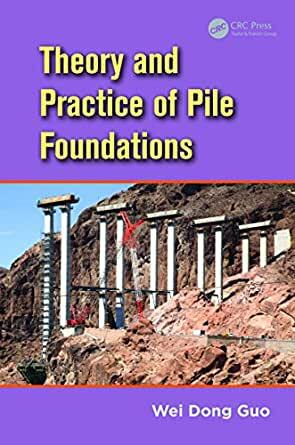 9.2 Solutions for pile–soil system. 9.3 Slip depth versus nonlinear response. 9.4 Calculations for typical piles. 9.5 Comments on use of current solutions. 9.6 Response of piles under cyclic loading. 9.7 Response of free-head groups. 10.2 Solutions for laterally loaded shafts. 10.3 Nonlinear structural behavior of shafts. 10.4 Nonlinear piles in sand/clay. 11.2 Overall solutions for a single pile. 11.3 Nonlinear response of single piles and pile groups. 12.2 Mechanism for passive pile–soil interaction. 12.4 pu-based solutions (rigid piles). 12.5 E-E, EP-EP solutions (deep sliding–flexible piles). 13.2 Apparatus and test procedures.